Lemon balm possess lots of health benefits and medicinal uses that not many people are aware of. Since the middle age, it has been used for reducing the symptoms of certain ailments. In this post, we shall be looking at five ways lemon balm can help in fighting against certain diseases and ill conditions. Studies have found that lemon balm tea is effective in improving one’s mood and reducing cortisol, or stress hormones. Also, drinking lemon balm tea can help reduce your anxiety levels and improve your cognitive functioning. Lemon balm tea is also a great home remedy that will help in reducing the symptoms of indigestion such as bloating, acidity and severe stomach aches. 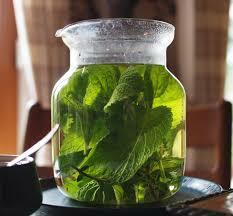 Studies have found that it can improve your digestion and works better if consumed with peppermint leaves. Patients suffering from cold sores and herpes lesions can try applying lemon balm oil on the affected areas for some relief. A study that included 116 patients who had minor cold sores caused by herpes, topically applied lemon balm oil for around eight days following which almost 96% of them reported complete clearing of lesions. One of the most common causes of insomnia is depression and anxiety. If you have trouble falling asleep at night, drink a cup of lemon balm tea as the leaves also have sedative properties that can aid in getting better sleep..
A study published in the Journal of Neurology, Neurosurgery, and Psychiatry found that after four months of administering lemon balm extracts to patients living with Alzheimer’s disease, they were less agitated and also reported better cognitive functioning. This is because lemon balm can help in reducing anxiety levels and also improve memory in patients suffering from mild to moderate Alzheimer’s disease. These are some of the health benefits and medicinal uses of lemon balm. If you are aware of some other existing ones, kindly add them by commenting below.